In this section, we will create controller's action and its corresponding view template that would allow site visitors to preview certain post by entering the following URL in browser's navigation bar: http://localhost/posts/view/<id>, where <id> is the unique identifier of the post. and to create the view.phtml view template. * This form is used to collect comment data. // This method adds elements to form (input fields and submit button). 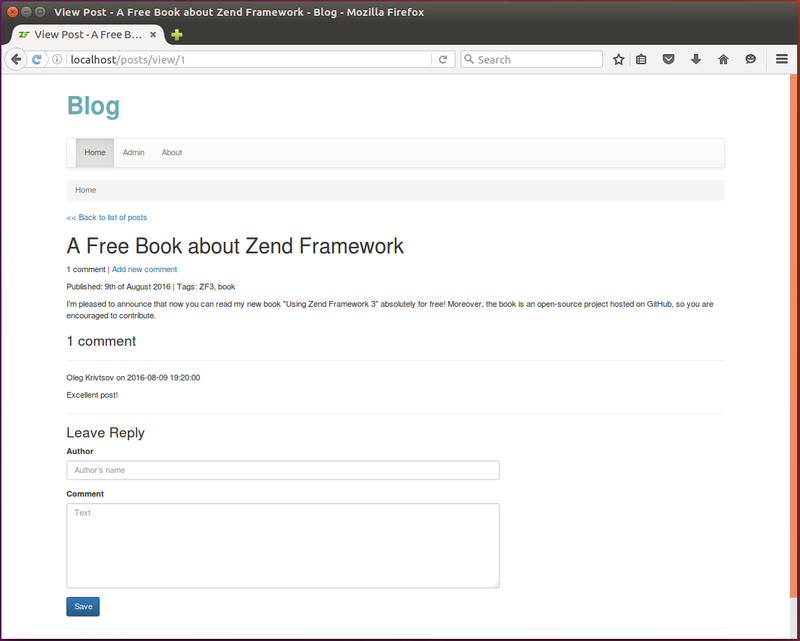 As you see from the code above, the CommentForm form contains the author, comment fields, and the Submit button. and the addCommentToPost() method will be used for adding a new comment to post. * The PostManager service is responsible for adding new posts. // Returns count of comments for given post as properly formatted string. // This method adds a new comment to post. // Create new Comment entity. * to add a comment to post. // Use post manager service to add new comment to post. // Redirect the user again to "view" page.